According to government reports, recent flooding and landslides in Sri Lanka have caused widespread disruptions across the country. At least 200,000 people have been displaced by the floods, many casualties have been reported and dozens are feared missing. Government accredits this to climate change. This is not a normal situation for Sri Lanka. We have been discussing this disaster since 2010. Our previous reports signalled this situation before it dawned. Reports were handed over to President, Environment Ministry and other responsible persons and institutes. Through the reports and campaigns, we pleaded a number of times to stop destroying sensitive environment areas, while implementing a national physical plane – only to deaf ears. We are in a capitalist system concerned about the profit for business. The government is implementing mega, yet unsustainable, development projects in natural habitats. The National Physical Plan, to be implemented from 2011 – 2030 with the aim of developing the country, follows the easy path open under globalization. It is important to analyse the plan considering its implication on environment and socio-economic and political situation of the country. This plan intends to develop the country as a centre of naval and air travel, trading, power and education but not as a centre of environmental protection or farming. A previous government entered an agreement with 36 countries including India and China on July 4, 2005, to build a network of highways in Sri Lanka and link it with the Asian Highway network. According to this agreement, highways will be constructed between Matara and Hambantota, Kandy and Colombo, and Hambantota and Ampara. Finally it will be connected to Asian highway network via Mannar and Danuskody in India. In addition to these main highways in the country, the other main towns will also be linked through a similar highway network. The length of this road network will be around 11,697 km and they will be constructed by sand and earth filling as in the case of Kottawa – Pinnaduwa expressway. An island-wide railway network will also be constructed and linked to Indian railway network through Adam’s bridge at Mannar via Danuskody in India. It has also been planned to charge exorbitant rates for travelling. Tourism will be prioritised in the development plan. Tourist hotels will be constructed along coastal belt, beaches and lagoons and at ecologically important places to promote tourism. The proposed hotels will emerge in areas from Chilaw to south and north in country, in ancient cities like Anuradhapura and Polonnaruwa and forest areas of Bibile and Nilgala and other locations. Countries such as America, China and India wish to develop Sri Lanka as a centre of air travel. For this purpose, Katunayaka airport will be expanded and improved. Two new airports will be constructed at Mattala and Higurakgoda. It has also been planned to develop the existing airports at Palali, Trincomalee, Puttalam, Batticaloa, Kalutara, Ampara, Vauniya, Anuradhapura, Galle and Ratmalana. Since 2013, new airports were to be constructed at Kandy, Nuwara Eliya and Dambulla. Sri Lanka will have 19 airports by 2030. The national physical plan proposes to develop areas like Anuradhapura, several places in the north and Monaragala for production of export-oriented crops such as vegetables, groundnuts, sugarcane, farm oil and timber for market. Investors will be allowed to start new industries. Municipal council zones, special towns and district capitals will be established in agriculture-based areas like Mannar which have now been earmarked for development of industrial zones, investment zones, information technology centres and commercial centres and not as centres of agriculture. Areas from Gampaha district to Kalutara, from Matara, Hambantota up to Tanamalwila will be declared as Municipal zones. Similarly, the areas between Ampara and Batticaloa will be renamed as Eastern Municipal Zone while Trincomalee, Polonnaruwa, Dambulla and Anuradhapura areas will come under the North Central Municipal Council area. Mannar, Kilinochchi and up to Point Pedro will be renamed as North Municipal Council Zone. The other development activities proposed are mining of minerals in the coastal areas, different types of hydropower generation activities, nuclear power and coal power generation and development of 40 fisheries harbours and increasing the number of fishing crafts in use up to 40,000. Development of fibre optic information network from Batticaloa up to Hambantota connecting Lahugala, Yala, Udawalawe Wildlife sanctuaries is also included in the plan. The national physical plan creates seriously negative impacts on eco-systems which have not so far been disturbed from developmental interventions. The proposed municipal zones, highways, coal power and nuclear power generation projects and commercial crop cultivation activities will affect environment. As a result of Colombo–Matara expressway, Sinharaja forest (declared as a World Heritage), will be fragmented twice and 39 forests including Sinharaja will be destroyed due to the proposed development activities. The Udawalawa wildlife Sanctuary, Wetahirakanda, Lunugamwehera, Madunagala, Weerawila, Nimalawa, Bundala, Ussangoda, Kataragama, Katagamuwa, Ruhunu Yala, Sagama, Buddangala, Ulpassa, Egodayaya, Mahakanadarawa, Anuradhapura, Mihintale, Ritigala, Kahalla, Pallekele, Sigiriya, Minneriya, Giritale, Elehara, Bakamuna, Kavudulla, Somawathiya, Neval headwork, Chundikulama, Wilpattu, Yodawewa, Wenkaladi, Madu Reservation, Muthurajawela, Kalametiya, Priyakachchi Wildlife Sanctuaries and forest reservation will be highly disturbed. Bibile Nilgala area would have tremendous repercussions as a result of the proposed hotel complexes. Grabbing lands for these purposes will continue. Forests prevent soil erosions. It also prevents debris in wet areas and hill country. Root systems in trees hold the soil layer and protect earth from landslide. Destruction of forest cover increased soil erosion, debris and landslide. Percentage value of available forest area in 2012 is around 16.5 and by 2030, this will be further reduces to 13 – 10 percent with the decrease of forests. In 2011, around 65,000 acres of land was given to the Dole Multinational Company and CIC Company from the reserved forest areas for banana cultivation. If this trend continues along with the proposed development activities, the percentage value of the existing forest area will go down below 10 percent. Currently, out of the land area of 65,525 sq. km in the country, 83.5 percent is already in use for tea, coconut and rubber cultivation, construction of towns, human settlements and other crop cultivations. The remaining land area under forest cover is only 16.55 percent. Sri Lanka is now ranked fourth among the countries destroying primary forest. Soon it will become the first. This will lead to extinction of biodiversity, threatening the flora and fauna species. It has been identified that 103 rivers will be dormant like in the case of Maduru Oya. There are riffles and pools midstream of every river. Riffles and pools of rivers have been covered by concrete buildings, roads, micro hydro projects and mega development. People have blocked water-feeding channels in Kelani river. Riffles and pools are located in Kaluaggala, Awissawella, Waga and Hanwella. 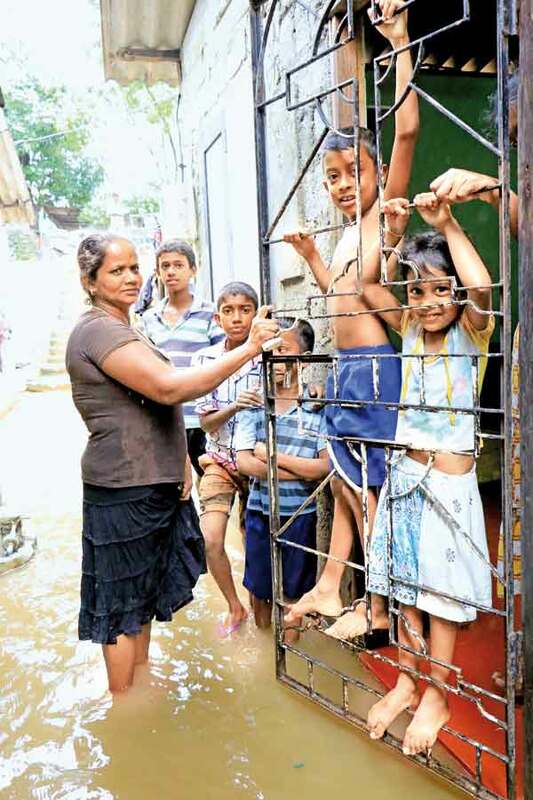 Colombo-Awissawella road and many buildings were built blocking and destroying riffles and pools. It leads to flood and landslides. Flow of water in the bed should be natural. Riverbeds and downstream rivers are filled with sediments. Both stream beds do not have a regular and natural flow of water. Transport in sediments in rivers come from flood plains. Erosion and construction around rivers have been affected. Due to construction of Pico hydro power on the top of Laxapana waterfall and Kitulgala, Kelani river receives tons of sediments. It has only led to heavy floods in Hanwella and Colombo. In the process of building of large cities, expressways, airports, tourist hotels and roads, a large number of minor tanks will disappear and tank cascades will be blocked disturbing the natural water flow conditions. As a result of that, droughts and floods will become a recurrent feature in Anuradhapura, Polonnaruwa, Trincomalee, Kurunegala and other areas. Floodplain is the neighbouring part of river or stream. That stretches from the banks of its channel to the base of the enclosing valley walls and experiences flooding during periods of high discharge. Floodplains of Buddha Nullah are located in the entire length of Ludhiana city. Kelani river’s floodplains are located from Kaduwela Bridge to tributary of Kelani river. An expressway was built while destroying Muturajawela and other wetlands. Kaduwela and Ja-ela areas did not experience floods before the expressway was built. Encroachment of floodplain has caused the massive disaster. Many floodplains have been taken to build sites of homes, businesses and other urban development. Rainfall causes higher water levels in Kelani river. As a result, human settlements of floodplain would be in trouble around floodplain areas. The Mahaweli Development Plan, started with the objective of achieving a tremendous development within a short period, resulted in ecological disasters, such as landslide, floods, elephant conflicts, land fragmentation and commercialisation of agriculture and the pauperization of peasantry, losing biodiversity. The country is still paying debts to international funding agencies that provided funds for Mahaweli Accelerated Development Programme. This trend continues with the development activities proposed under the National Physical Plan. A landslide hit the whole village of Meeriaybadda causing a number of deaths. The reason is Uma Oya project in which the grilling and blasting method is used to break rocks and drill tunnels. The vibration is felt in the whole area with an inevitable risk of landslide in future. Most countries which underwent projects like Uma Oya faced the same fate. Environment laws are sufficient to protect nature and prevent disaster. But all laws are under pressure of political power and money.